I love my sweet treats. I wouldn’t have a baking blog named Oh My! Sugar High if I didn’t. Unfortunately, sugar isn’t always kind. Whether it is adding inches to my waistline or simply a case of over-consumption, sometimes a sugar substitute is in order. SPLENDA® has launched a Tumblr page at called 365 SWEET SWAPS™ to give you inspiration on ways in which you can reduce added sugar in your diet daily. You’ll find daily tips and recipes using Splenda to make it even easier to live a healthier lifestyle, every day of the year! I especially love their animated GIFS which show steps in a bit more detail or simply make the post more fun! 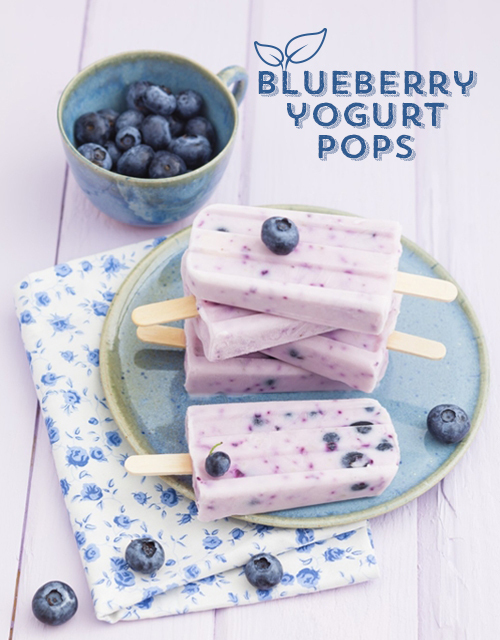 I was sent a few recipes that are featured on 365 SWEET SWAPS™ and some like this Pomegranate Ice Tea and these Blueberry Yogurt Pops called to me. I love recipes that are quick and easy. With only three ingredients, these yogurt pops are a perfect way to cool down on a hot summer day and satisfy a sweet tooth. Wouldn’t you agree? Simply stir together fresh blueberries, yogurt and SPLENDA® No Calorie Sweetener together before pouring the mixture into a pop mold. Add some flair to your pops with your own unique pop mold. Freeze for at least 5 hours. I can’t wait to see your ideas! Disclosure: This post is brought to you in partnership with SPLENDA®. All thoughts are my own.